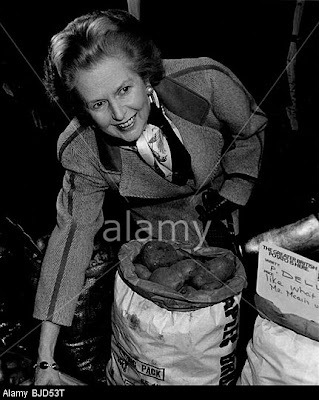 Mrs Thatcher in typical Conservative poster propoganda; and visting Yorkshire in the 1980s (latter pic by David Hickes, available on Alamy). IT is perhaps a sign of the times that street parties are currently being staged to celebrate the death of the former PM Lady Thatcher. While no sentient person with any form of fine sensibilities would wish this indignity on anyone, the fact that such a reaction is being generated within hours of her death perhaps illustrates the polemic attitude her name engenders. 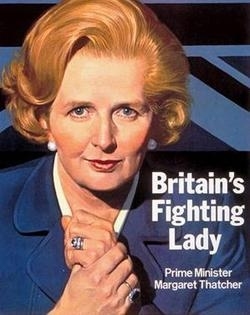 For many, Mrs T will always be the ultimate Marmite politician; adored by many and vilified by others in equal measure. In leading tributes to the Iron Lady, despite a degree of political alienation, former Prime Minister Tony Blair and Labour leader Ed Miliband have both condemned the exuberant celebrations of anti-Thatcherites, urging respect. Mrs Thatcher may have been hated in some quarters, but she was not a despot in the mode of Gaddafi or Saddam. Prime Ministers of all colours are still part of our constitutional monarchical democracy. More than anything else, she also perhaps represented a decade to many in Britain – the 1980s; an epoch which came out of the Winter of Discontent in 79 and which ended (for some) with the Harry Enfield type loadsamoney boom in 1988-88 and the rise of the ‘Yuppie’. In the summer of 1981, I was just 12 and I remember a visit to London with my parents, as it happened, on the way to see Bjorn Borg in his heyday at Wimbledon - a fortuitous break. In those days, and at that age, a trip to the capital held all the excitement and enchantment that might be expected of a young lad. Staying in a hotel in Bayswater, walking round Kensington Park, visiting museums, listening to a new album called Magnetic Fields by Jean Michel Jarre blaring out of the record shops on Bayswater Road or Queensway. In that summer, unemployment was rocketing. I still recall, on the Tube, seeing posters of the Conservative advertising campaign esrtwhile of the 1979 election victory. ‘Labour Isn’t working’ depicted a stark headline with a snake of people queuing for a job; alongside might have been a poster for ‘For Your Eyes Only’, the latest Bond film of the day. Even then, I recall it being ironic that, two years after the Conservative victory, a record number of people were out of work. Conservatism it seemed also wasn’t working. Mrs Thatcher thought the solution to the economy was to adopt a ‘monetarist’ policy – the control of the money supply to attack inflation. The US economist Milton Friedman in A Monetary History of the United States, 1867-1960, argued that "inflation is always and everywhere a monetary phenomenon”. Whereas Labour had adopted a fiscal policy – the manipulation of government spending and taxation to influence the economy, this had led to a boom/bust situation. On top of that, the strength of the unions was such that an economic intransigence arose. But by the late 1980s, the economy, in some quarters at least, was starting to superheat; yuppies carried brick-like mobile phones, the privatisation of many nationalised industries encouraged a capitalist boom and a wider share ownership of such industries among a hitherto largely market ignorant populace. While many will understandably baulk at the thought of the tax payer paying for the full military honours of Mrs T’s funeral, perhaps her greatest legacy will be as an icon for British politics at its most expansive. Labour under Michael Foot was pretty far to the left; it had a Militant wing, and to its further Left represented socialism almost bordering on communism at its very left wing extreme. The more moderate Labour members, and those to the right of the Left, were quick to spot a gap in the political market, hence the formation of the SDP, which filled a political vacuum closer along the spectrum to the old Liberal Party. Mrs T had little choice but to take the Conservative Party further to the right while at the same time, the more extremist Conservatives shifted to the right of the right. The extreme wings of the nationally jingoistic parties and even forms of fascism lie further to the right of that section of the spectrum. In 1987/8, at the height of Thatcher’s Tory over-lordship, with the markets booming and with a thundering majority under her belt, Mrs T could perhaps have been forgiven for thinking the Conservatives were unassailable. Margaret might even have pictured herself as a new Britannia, or even a female Caesar, a one- woman Cabinet. Autocracies rarely work in a democracy, and Maggie’s cabinet rebelled. Quite who was the Brutus or Cassius is debatable. Today, as with other icons of the 80s, Maggie’s world now seems aeons ago. Under Mrs T’s administration, it seemed, to those who remember her, that there would never come a time when she wouldn’t be there – for good or bad. In the angst ridden present of a debt-ridden Britain, the political spectrum has also changed. Tony Blair brought the Labour Party in from the left to become what some viewed as an only-just left of centre party. Faced with the prospects of an Iraq War, Blair’s much reported angst over the decision would have seemed like Hamlet’s ditherings next to what would no doubt have been a more resolute decision by Mrs T.
It would fall to John Major, in the early years of his premiership, to take up to war mace as part of a US lead coalition. Politics today is much narrower affair; populist politics, if this isn’t an oxymoron, covers a much narrow section of the political spectrum. Labour’s shift to the right under Blair, John Major’s more moderate politics, a rise in ‘green’ thinking and the dissolution of the mainstream SDP, not to mention a Tory-Liberal coalition – probably unthinkable under Maggie – means there is now little to choose between the main parties, and certainly by comparison to the polarised days of the early 1980s. The only effect of a narrowing of the ‘mainstream’ spectrum can be drawing in of the more political extremes – a concertina of candidates if you will. UKIP has gained ground with its staunch ‘Englishness’ views while the troubles on the Continent have only exacerbated anti-Euro opinion; a fellow PM, Ted Heath was pro-Europe though Maggie fought tooth and nail for rebates from what she would later view as the bureaucracy of Brussels. Mrs T, a grocer’s daughter, also always espoused a view that the country should be run within its own means, just like a household – or indeed a grocer’s shop. Had she been around today, perhaps the debt crisis might not have arisen. Then again, in an age of the internet, celebrity, where seemingly everyone wants to live a luxurious lifestyle, fed by wall to wall media images of the trappings of a rich life, perhaps the UK meltdown in 2008 was unavoidable, one which might even have been beyond the wiles of Mrs T’s ‘brilliant’ chancellor Nigel Lawson. (Is it also ironic that Nigella Lawson, Nigel’s daughter, should be the poster girl for the ‘have it all’ lifestyle which many still strive to attain beyond their means?). Perhaps the greatest comparison can only come with the theatre – many an actor treads the stage of life and politics, but only a few are truly remembered. Thesps, just like politicians, come and go, but it is only the Gielguds, Oliviers, Garricks, Streeps and Garbos who really shine. In these austere days, perhaps it is good for us all to remember when politicians had immense character - however we might boo - on both the domestic and international stage. Revisionist politicians and historians will take their own view of Mrs T 20 years from now. For one who spent his salad days in the Thatcher years, the Iron Lady’s mettle was never in doubt. Perhaps one day, another woman will become PM once again. The temptation of the ruby slippers of politics will sparkle for some time yet one feels.